These objectives require a new emphasis in our foreign policy based on the recognition that national security depends on an international effort to maintain an equitable and stable international order. declaration of Canada’s intention of becoming a nuclear-weapon free zone and appropriate action to receive recognition of that status from other nations. Canada should make it clear that from the beginning it regarded the North Atlantic Treaty Organization (NATO) as an interim security measure until such time as a general system of collective security could be established. 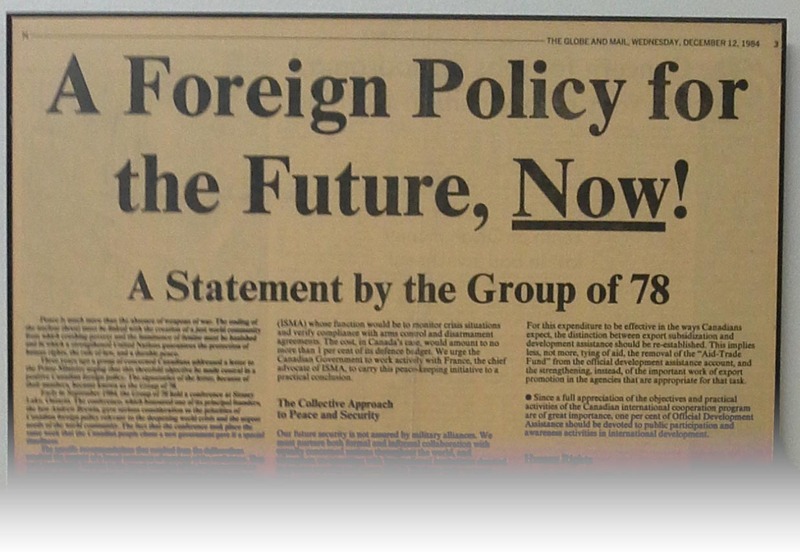 It was never intended to be an organization to perpetuate, let alone to wage the Cold War. In association with other middle powers, Canada should make use of NATO to promote consultation among its members and should enter into negotiations with the Warsaw Pact countries to achieve a planned reduction of military power on both sides. It was Canada’s initiative at the United Nations in 1956 that led to the establishment of the first UN peacekeeping force that was largely instrumental in bringing an end to the Suez War and maintaining peace in the region for a decade. Since then Canada has been a loyal contributor to most UN peacekeeping forces that have been set up to contain war and bring an end to fighting. Canada should renew its efforts to place peacekeeping on a more permanent basis and establish international machinery for the pacific settlement of disputes. Canada should also support UN efforts to establish an International Satellite Monitoring Agency (ISMA). Such an agency, at present being actively studied at the United Nations, is a proposal for a peacekeeping force in space. Canada should increase its support of multilateral activities carried out through the United Nations and its Specialized Agencies, designed to promote full partnership in development cooperation and to strengthen the self-reliance of developing countries within a supportive world community. progressively untying its funds devoted to international development cooperation. Canada should work in close collaboration with other members of the Commonwealth in the pursuit of foreign policy objectives designed to promote disarmament, strengthen international peace and security and establish a more just international economic order. It should be constantly alert to the possibilities of joining with other like-minded nations in the pursuit of these goals. Its geographical position and its historical tradition of friendship and mutual interest have established special relationships with the United States which should be taken into account. But this relationship should not dictate Canadian policy, particularly when actions are undertaken or promoted which are seen to be contrary to Canada’s considered obligations and the world’s needs. Adoption of these proposals by the Canadian people and government would, in our judgement, aid the cause of peace and Canadian security, and would make a much needed contribution to a more just and stable world. Dr. J. Francis Leddy, honorary president, World Federalists of Canada; former president, University of Windsor.